A couple months ago the U.S.-based ReFED report came out to much fanfare and massive media attention and for good reason. The report was a groundbreaking collective effort to present updated data and cost-effective solutions to reduce wasted food. The most notable new data figures showed that we now waste $218 billion in food totaling 70 billion pounds each year. However, one glaring statistic deserves a second look; that's the amount of produce wasted, before stores, which now stands at a staggering 20 billion pounds a year! Feeding America had completed a study a few years back that estimated wasted produce (before stores) to be six billion pounds of opportunity. Since then, 6 billion had been the figure that has been used when referencing this issue. What the new ReFED study shows is that we need to step up our game to really address this 20 billion pound elephant in the room. 20 billion pounds consisting mostly of perfectly nutritious and delicious produce, that looks less than "perfect," wasted every 12 months. All the while almost 50 million people are food insecure and almost 90% of us (over 270 million) are not eating enough fruits and veggies in the U.S.
How much is 20 billion pounds of produce? It's a very large number for which most of us, myself included, cannot readily visualize. So let's use my friend Jonathan Bloom's famed wasted food example of Rose Bowl-Sized Stadiums. 20 billion pounds would fill up such a large football stadium about 45 times! Also, 20 billion pounds is the weight of roughly 10 million large elephants (or 40 billion tomato elephants like the one above). So what are we doing to reduce this 20 billion pounds wasted each year? We have some grocery stores like Associated Foods, Giant Eagle, Hannaford, and Whole Foods Market, with small pilots to sell "ugly" produce in a number of stores. We have ugly produce delivery companies Imperfect Produce and Hungry Harvest saving hundreds of thousands of pounds annually. We also have amazing farm to food bank programs, with government and farmer support, saving hundreds of millions of pounds of "ugly" produce for those in need each year. Yet, with those great steps in the right direction, they are still only chipping away slowly at this massive 20 billion pound ugly fruit elephant in the room. As Congresswoman Chellie Pingree proposed in the Food Recovery Act, we could be introducing "ugly" but perfectly good (and cheaper!) produce into schools, but we are not. The leading grocers listed above are a great start but, with small pilots consisting of less than 100 total stores, it is only a fraction of what could be if all grocers started selling. We could also be funding farm to food bank programs in every state in the country but we haven't quite reached half yet. There are so many solutions to this problem and massive opportunity that we could be effectively putting money, resources and time into, but we are not. And it's really a gigantic missed opportunity. a. Purchase imperfect (sometimes "ugly") fruit and veg: at the farmers market, though a home delivery service like those above, at supermarkets or wherever you can find them. b. 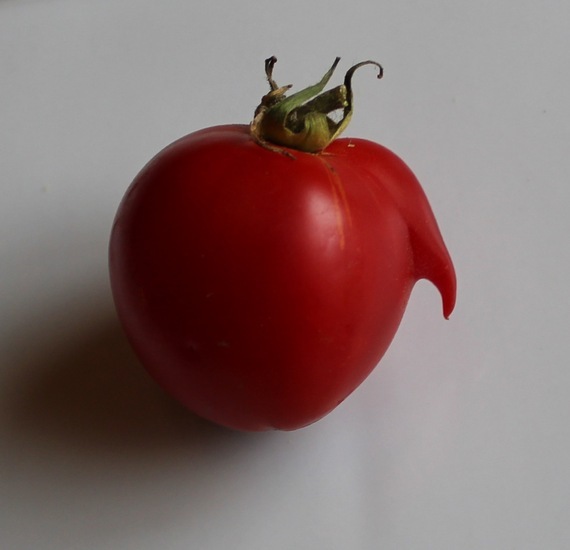 Talk about the issue and share your "uglies" pics with your friends and the world at my various @UglyFruitAndVeg social media accounts. a. Put more pressure on our nation's grocers to accept responsibility in this matter. i. You can do this here. ii. Myself and Culinary Nutritionist Stefanie Sacks, author of What The Fork Are You Eating?, also ask you to join us in asking Walmart to sell "ugly" produce. After convincing Whole Foods Market to start, we are focusing on Walmart (with over 4,000 stores!) but will certainly move on to others. b. And grocers should do more than just sell ugly but also educate their shoppers that this produce is perfectly good and part of a great solution to reduce waste and eat healthy. a. We need our students, our youth, to eat more fruits and vegetables, right? What better way than to educate them to love ugly and save money while their school buys cheaper, but imperfect, fruit and veg! b. In many ways, produce shaming is parallel to body shaming and bullying - we should be teaching our students that produce can be imperfect and still beautiful. a. You can also ask your state government if they support farm to food bank programs (or if they can start such a program or support them further).